12 pounds! Now that’s a lot of baking soda. I’ve decided this is to be the year when I really get a handle on homemade non-toxic cleaners of all kinds, by testing a bunch of recipes and tips to see what works. I already use my citrus-vinegar spray as a general purpose cleaner, either diluted with water or neat, which I love. And I use homemade wool wash and sometimes use homemade general pupose laundry powder. And I also use vinegar and bicarb soda for their many cleaning properties in various ways around the house, sometimes together, sometimes alone. But there are so many other DIY cleaners that I’ve read about, which I’m sure would make my house that much nicer and cleaner if I were to use them. Well, I have started testing. Now, here is where I confess to what sort of a house keeper I am. A lazy one. That does not mean I have all sorts of tips to, for instance, clean your oven without effort. No, it just means I don’t clean my oven. Now long term readers may have picked up that I am home with the kids three days, and my husband is two days. So does he clean the oven on his days? No, I’m afraid not. He generally does most of the laundry on his days, but clean the oven? I think not. So, I had a good and filthy oven to test the oven cleaner tips on. In fact, a while ago I made a rhubarb pie which bubbled up and leaked onto the oven floor, and I forgot to clean it up before I turned the oven on the next time. Needless to say, blacker than black was barely an exageration. In the morning you can wipe it out easily (! ), and perhaps use a little eco-safe dishwashing liquid to give it a final wipe down. Did it wipe out easily? 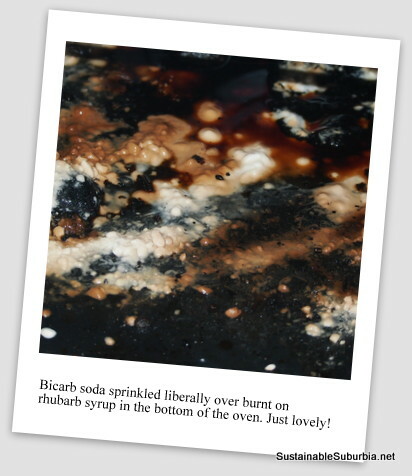 Well, the bicarb did, but was the oven magically cleaned under it? Not so much. I am, however, perfectly prepared to believe that a less filthy oven might have cleaned a bit more easily. I imagine this may clean off the grease, but baked on sugar is a different matter. As it is, the oven floor is a lot cleaner than it was yesterday. I am out of bicarb now, but when I get some more I will try it again, to find out if my now much cleaner oven will clean all the way with another go. I suspect it will still take quite some elbow grease…. Ha ha! Maybe keep a baking tray under the rack you’re baking on? Easier to get out and clean. I hardly ever clean my oven (and bake often) but bicarb sprayed with citrus cleaner keeps it reasonable.i don’t leave overnight though. Just clean then and there. I might try it with the citrus cleaner as well next time. Seems like it would help! Grimy ovens–the achilles heel for the green cleaner. Whilst I agree that bicarb and other gentle, non-toxic products can do a decent job, provided the oven isn’t too greasy, it’s the dishwashing liquid you mention that is going to do the best fighting. The best way to clean an oven–do it when you make the mess, do it regularly and don’t let it get out of hand. I have purposely cut down on doing end-of-lease cleans for clients as the ovens I was meeting were well beyond what any green methods could handle. I think we can accept: one may need more than bicarb and vinegar to clean a car engine; same goes for an oven that has been let to go. Thus, unfortunately, there are some instances where a degreaser is required. Having said that, one ought to at least give the gentler, friendlier options a go first. I used to buy every swingin’ cleaner that would come down the pipe because I was lazy and simply didn’t want to scrub. I went kicking and screaming into trying natural cleaners, but now that I have, I’ll never go back. I’ve got 12 natural cleaning recipes on my blog that you might be interested in. My favorite is the “Alice’s Wonder Spray”. Can’t believe how much cheaper and healthier using homemade cleaners are. If you have a moment, would you mind also filling out my quick check-box survey on Facebook? http://www.facebook.com/questions/498973470145195/ just about which ingredients you use in your DIY cleaning products. Yes it’s true we must secure first the oven to say that we have a healthy home for our family.. I foind that tea tree oil and citrus is a good organic and green way to break down tough stains in ovens. Some of out customers request it done green and this way always seems to get the best results. I find that if you put a bowl of hot water in the oven and leave it until it cools it loosens up the heavier stains. Then you use your baking soda and citrus spray. Amazing how much it cleans. Thanks Wendy, that’s a good tip! Just a quick comment to say thanks a lot for your post and also ask (including other commenters) if they have ever had to clean a cooker when moving in to a new house and has that made a difference to how they’ve cleaned it? I don’t know what it is but I just can’t bring myself to cleaning someone else’s grease and grime, especially in the oven! I don’t know if I’m weird but it really makes me cringe haha. I usually get my OH to do it, but I have been known to get the professionals in too I won’t lie! When we last lived in the area I got Falsh Cleaners to come and do it. Anyone else? or without. This is by far the quickest way to make money through online. I’ve been using baking soda in removing stains and I also tried it alongside with lemon and it is more effective. Thank you for sharing this one. Baking soda is just amazing! I really prefer using it instead of any other cleaners! Thanks for sharing! I would love to clean my oven with baking soda! Advice for Eco-cleaning the oven is best in the above article.I would apply all tips when i clean my Oven.Thank you so much for sharing.Waiting for next post too!